Jasmyn Shumate (right) and Syndi Jean (left). Photograph by Logan Kirkland. The Lens Collective 2018 was created by Alysia Burton Steele of the University of Mississippi Meek School of Journalism. Steele organized eight universities, including American University (AU), 38 students, and 15 mentors for a four-day intensive multimedia workshop. This year's theme was civil rights. The students, including AU School of Communication students Jasmyn Shumate and Matt Cipollone, had one full day to shoot their projects and about eight hours to edit their films. The films premiered to the community. Topics ranged from efforts of desegregating a church, a cafe where most of the civil rights leaders would eat at, the Grammy museum, the shooting and destruction of the Emmett Till's sign, and so much more. Watch videos from Cipollone and Shumate. When baby boomers bog graduating seniors with the question, "So what's your next move? What are you going to do after college?" I simply respond and say that I am going to travel the world and tell stories. I think the world would be a much safer, secure, happy, vibrant and healthy place if we all knew more about each other. 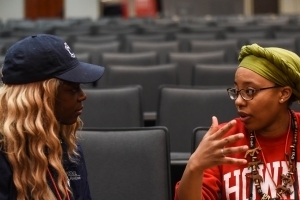 This conference included a series of group instructional workshops led by professors and mentors in the conference, covering topics from Adobe Premiere Pro video editing and audio recording and mixing. These workshop sessions were extremely helpful for me. As a Public Relations and Afro-American Studies major, I was not able to take many film and media arts production courses at American University (AU) so this allowed me to get my hands wet and help pace me along the week-long conference. The Lens Collective Digital Storytelling Workshop connects real people with real communities. Students are matched with community members and partners to build and exchange ideas and stories. The three-minute documentary that my partner and I created at the end of the session was just a small snapshot of what we captured that weekend and what the experience meant to us. It was humbling, truly humbling, to be in that environment, a place not too far from home, as my family grew up in Kemper County, MS which is about three hours West from Clarksdale, MS. When we pulled up to Ole Miss I honestly didn't know what to expect. I mean, when my ears hear and feel the word "Mississippi" there is often a deep breath that follows the thought because of the historical tension that has stood on the grounds of the state and its residents. Touring campus grounds and meeting students from the hosting university put this experience into perspective. So much of my perception of Ole Miss and Mississippi have been visualized through a timeline kept with tight annotated notes. I took each day with ease, headed into the morning with no exceptions and walked into every space with open arms to absorb as much of this culture and space as I could. I set aside pre-meditated thoughts and listened a lot with my eyes. My Canon 5d and Nikon 35mm cameras were my tools of choice for that particular weekend but I was conscious to not let them become a divider between my subject and me. During the conference we heard from several professional photojournalists who emphasized the importance of establishing trust with your subjects, that this is the most important when capturing a story. The best stories are those that are humanized and reflect the journey of an individual's experience throughout time and space. Attending the Lens Collective Workshop was a truly blessing...these words don't/can't really contextualize the experience/feeling I had during and have after the conclusion of the conference. Any student that is able to take this journey to the Delta is in for something special. Syndi, my partner and student from Penn State University, and I produced a video that focused on the African roots of Blues music throughout the Mississippi Delta. We interview Ms. Williams of the Crossroads Cultural Arts Center and her friend and musician Kumba who toured as around the city showing us how much of the past is still with us in the present. This four-day journey ended way too soon, and I am still holding on to this experience, and the people I met while on this journey. The memories are forever.